Since its founding in 1985, CAPACOA has fostered and developed a pan-Canadian network for presenters, presenting networks, artist managers/agents and performing arts administrators. CAPACOA began hosting an annual conference for the sector in 1988, bringing together cultural entrepreneurs and key industry stakeholders working across national and international performing arts sectors. In 2016, CAPACOA innovated its annual conference model by holding it in conjunction with the CINARS Biennale. CAPACOA was a founding member of Cultural Human Resources Council (CHRC) and Trade Team Canada Cultural Goods and Services. In 2002, in partnership with the Professional Association of Canadian Theatre, CAPACOA also helped to establish the Magnetic North Theatre Festival. CAPACOA was a key partner in the development of the Canada Arts Presentation Fund (2001) and was critical in helping to define its objectives and goals. CAPACOA began working in partnership with Canadian Heritage (2003) to develop and implement the annual Regional Presenting Networks meeting (now called National Network Meeting) where key board and staff assembled from across Canada to discuss issues facing the presenting milieu. This meeting has expanded (2009) to include all major presenting networks (multi and discipline specific). In 2007, CAPACOA participated on the CHRC's Performing Arts steering committee in the creation of the Presenters Competency Chart and Profile. This highly-effective tool has enabled multiple presenting organizations to evaluate and conduct needs-assessment on behalf of their own memberships, leading to skills-development, and ultimately the advancement of the field. CAPACOA launched The Succession Plan (2009), a mentorship and peer network development program for new generation arts professionals with a focus on the presenting and touring sector. CAPACOA conducted the study The Value of Presenting: A Study of Performing Arts Presentation in Canada (2011-2013) in collaboration with presenting networks and funding agencies across the country. This one of a kind action research has been an important driver of the discussion around the notion of public engagement in the arts. In 2016, CAPACOA partnered with the Indigenous Performing Arts Alliance and Ontario Presents to deliver a suite of initiatives meant at building new relationships between Indigenous arts leaders and non-Indigenous presenters. These included Host Nations Conversations and the Indigenous Performance Presentation Intiative. In 2017, CAPACOA published two landmark reports. 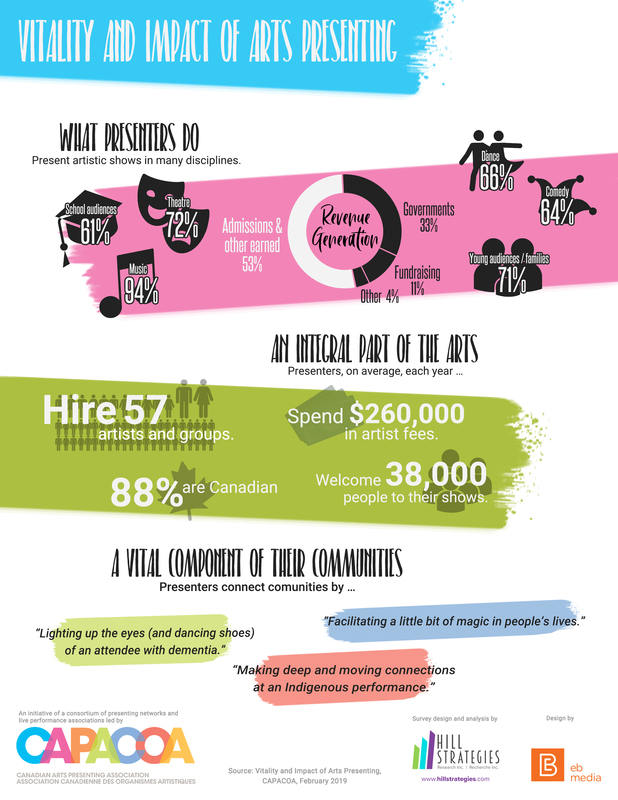 Vital Signs: Arts and Belonging (in partnership with Community Foundations of Canada) advanced the state of knowledge on the societal benefits of the arts. Digitizing the Performing Arts set out paths forward for the touring and presenting ecosystem in the digital world.